↑ "Siddharth Kumar Tewary's next on Porus for Sony Entertainment Television". Times of India. สืบค้นเมื่อ July 23, 2017. 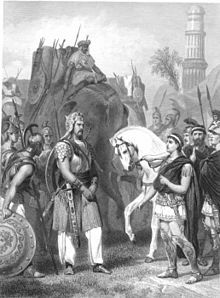 King Porus - A Legend of Old. Michael Madhusudan Dutt. Glorifying poem, describes a legendary victory of Porus over Alexander. Chisholm, Hugh, ed. (1911). "King Porus". สารานุกรมบริตานิกา ค.ศ. 1911 (11 ed.). สำนักพิมพ์มหาวิทยาลัยเคมบริดจ์. หน้านี้แก้ไขล่าสุดเมื่อวันที่ 24 กุมภาพันธ์ 2562 เวลา 00:37 น.